* I received a free product in exchange for my review. All opinions expressed in this review are my own. My diaper stash consists primarily of unbleached cotton prefolds, now that I’ve finally unloaded my pocket diapers (I just couldn’t force myself to like them). I’m unable to have a clothesline, so I dry my diapers in the dryer. If you’ve ever felt material in natural fibers, it tends to be a little rough and scratchy, even when using dryer balls to soften fabrics. Needless to say, when I had the opportunity to try one of Geffen Baby’s Jersey prefolds, I jumped at the chance because a.) it was a Geffen Baby prefold (and I’d heard great things about their diapers), and b.) the prefold was in a fabric I’d never tried in diapering. Declan’s current size, I use a combination of a newspaper fold and bikini twist when diapering him. Paired with how trim this diaper is to begin with, it almost looks as though D has a disposable diaper on! Made from four layers of 60% Hemp and 40% Organic Cotton, Geffen Baby Jersey Prefolds are super trim, as far as prefolds go. I have to be honest and admit that I really doubted the absorbency of this diaper, once I felt the layers comprising the prefold. I typically change D’s diaper every two hours, but I left the Geffen Baby on for three hours to really put it to the test. What I found was an incredibly absorbent diaper! Whereas Declan was typically soaked in the front of the diaper (in his regular cotton prefolds), the jersey prefold had plenty of dry area to spare. I’d heard wonderful things about hemp, and this diaper definitely proves how absorbent a fiber hemp is. If I used cloth at night (little guy’s skin is just too sensitive for overnight cloth), the Geffen Baby Jersey Prefold would definitely be one of my go-to diapers for 12+ hours of wear. If you’re anything like me, you put a more absorbent diaper on your kiddo when you’re setting out to run errands (please tell me I’m not the only person who does this). I will typically put on a bulky toddler diaper to ensure a.) that I won’t have to change a diaper while out (unless #2 is involved), and b.) that there won’t be an accidental leak. The Geffen Baby Jersey Prefold has now earned errand-running status! In a nutshell, this diaper is unbelievably soft on your little one’s bum, without trading absorbency for comfort. 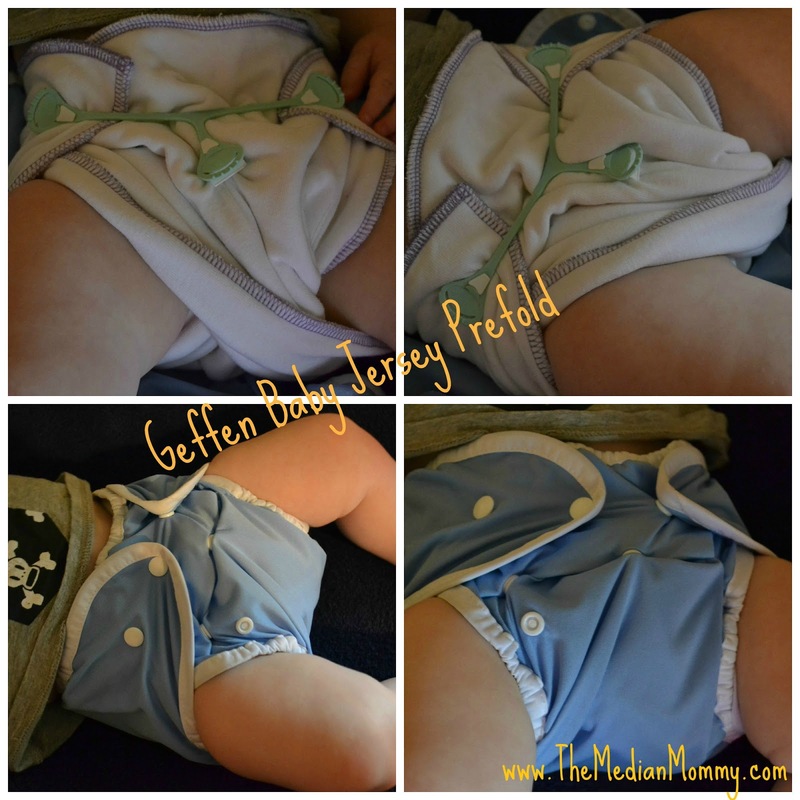 I would definitely recommend the jersey prefold, with 60% hemp, for both day and nighttime diapering. Made here in the USA, you can definitely feel good about purchasing Geffen Baby products. For more information about Geffen Baby’s full line of products, you can visit their website here. Use social media frequently? Check out Geffen Baby on Facebook and Twitter.